A 48 yearold smoker presents with central chest discomfort for 2 hours. 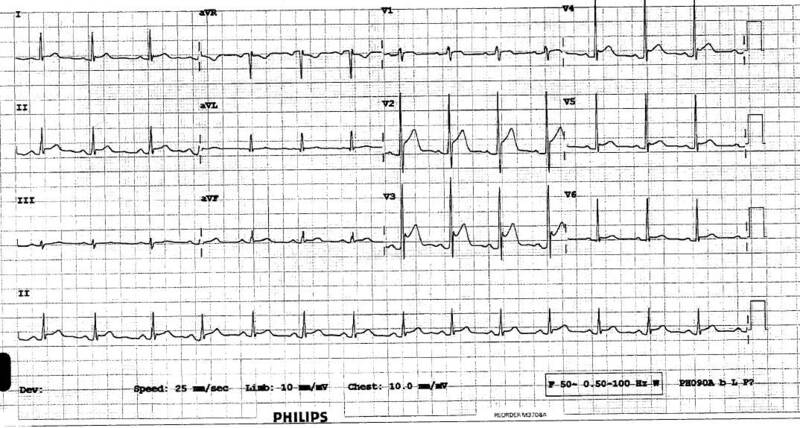 The most concerning feature here is ST elevation in a male smoker with chest pain. Morphology of ST elevation is very important however,and this STE is concave upsloping and also is found in more than one artery territory. In general ischaemic STE is horizontal and confined to a single artery (with reciprocal changes (usually of ST depression) seen in the leads opposite to the main area of damage). 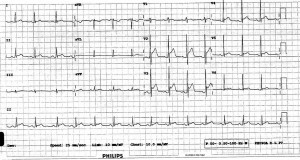 Remember that ECG changes in pericarditis are due to inflammation and damage to the epicardial layer of the myocardium, so all pericarditis with ECG findings have myocardial involvement…hence sometimes the very gnarly looking ECGs..the more myocardial involvement, the ‘worse’ the ECG looks. This patient had more classic pericarditis pain earlier but developed more ischaemic tightness in ED. We sent him for urgent coronary angio as his STE was evolving rapidly, but thankfully he had normal vessels. Copyright © 2019 TiCME Time Critical Medical Education. All Rights Reserved.